The Ikon Pass announced today that Taos Ski Valley in New Mexico will join the Ikon Pass for the 2018-19 season. Taos is the southern gateway to the Rocky Mountains, nestled in an intimate valley where Spanish Colonial and Native American history meet in the European village. The mountain boasts over 100 trails, including expert hike-to terrain on Kachina Peak. Taos Ski Valley is in the midst of a $300 million overhaul, including the recently opened ski-in / ski-out hotel, The Blake, and a new high-speed chairlift quad for winter 2018/2019. 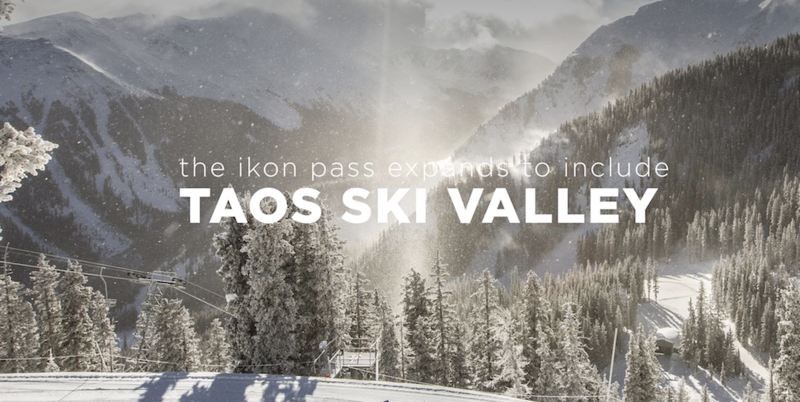 "Taos Ski Valley is thrilled to join the Ikon Pass and its impressive lineup of outstanding destinations," said David Norden, CEO of Taos Ski Valley. "Taos has been recognized as one of the iconic mountains of North America, is undergoing a major revitalization, and is the world's first certified ski resort B-Corporation. As such, our mountain culture and environmental ethos align with the Ikon Pass community. Taos is honored to have been selected as an Ikon Pass partner. " The 2018-19 Ikon Pass will offer 7 days to Taos Ski Valley, while the Ikon Base Pass will offer 5 days with 10 blackout dates, (Dec. 26 - 31, 2018, Jan. 19 - 20, 2019, Feb. 16 - 17, 2019).